Our teeny little neighborhood made it into the NY Times! And no, it's not because Gadhafi is hiding out here or because there is civil unrest afoot. We are being highlighted because of our farmer's market. Oh yeah, we are going organic. If you had any idea of the state of produce in Dubai you'd understand how monumental this is. Dubai, historically basically hasn't grown anything with the exception of dates and camel's milk. So nearly all produce is imported which means it is almost always in less than stellar shape and it's expensive. Lucky for us there are some enterprising locals and expatriates who have started small little organic farming outfits and they've banded together to create a farmer's market that takes place on the patio of Souk Al Bahar next to the Dubai fountain. Matt filled a bag with 3 dozen tomatoes and was told it was 8. Eight what? Handstands? Peanuts? Because there was no way we had just bought 36 tomatoes for $2. Apparently, we had. Matt and I backed away from the stand and contemplated a sprint. Surely we would be out of sight because they realized their error? But we were stopped cold in our tracks when we saw the stacks of strawberry cartons piled sky high. How much? 5dhs ($1.25). What per berry? In the store they are imported from the US and cost 30dhs - yeah $8 for a pack of strawberries. We still spent $8 but this time we came home with 6 packs of berries! We exchanged the nervous glances of people who just know they are doing something wrong, but it seemed that the vendors were as happy as we were. What was this some kind of produce heaven? Oh and I did I mention they have peeps there for the kids to play with? Enough said. It's small but we hope it grows! Complimentary lettuce to feed the ducklings - what a bargain. Weekend trips can take on a very different shape when you are jumping off from Dubai. Last week we were given 72 hours advance notice that we would be afforded a three-day weekend in honor of the Prophet's birthday. Not wanting any opportunity to see the world pass us by, I reached for my trusty protractor and studied the 5 hour flight radius from Dubai. Hmmm. Egypt, Bahrain, Libya, Sudan and Tunisia to the West...heard they are lovely this time of year, but's what's all this about revolution? Rain check. Our friends to the South? Saudi? This whole "I'm a woman" thing might get in the way. Yemen? This whole "I don't want to be kidnapped" thing might hold us up. Surely our friendly neighbors to the North? Iran? Iraq? Apparently those visas take awhile. So East it was! With Afghanistan and Pakistan pulling up the rear India and Nepal were neck and neck until Fly Dubai (our budget airline) ran a special to Nepal. A few clicks later and we were on our way to Kathmandu! 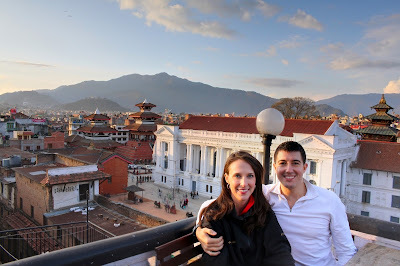 Matt, Lisa and I headed for 3 whirlwind days to the capital of Nepal. Sandwiched between two huge nuclear powers and home to 10 of the world's 14 tallest mountains, Nepal's people have a storied history. The country was almost completely isolationist until it opened it's borders in 1950. Centuries of pressure from India and China and a difficult geological placement make the Nepalese people some of the poorest in the world. The UN Human Development Index ranks them 142 out of 177. Then why do they look so happy? 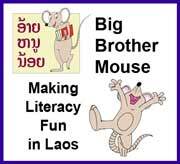 We quickly found out that they are fiercely proud of their homeland, their traditions, and have a warm impenetrable spirit that is really contagious. 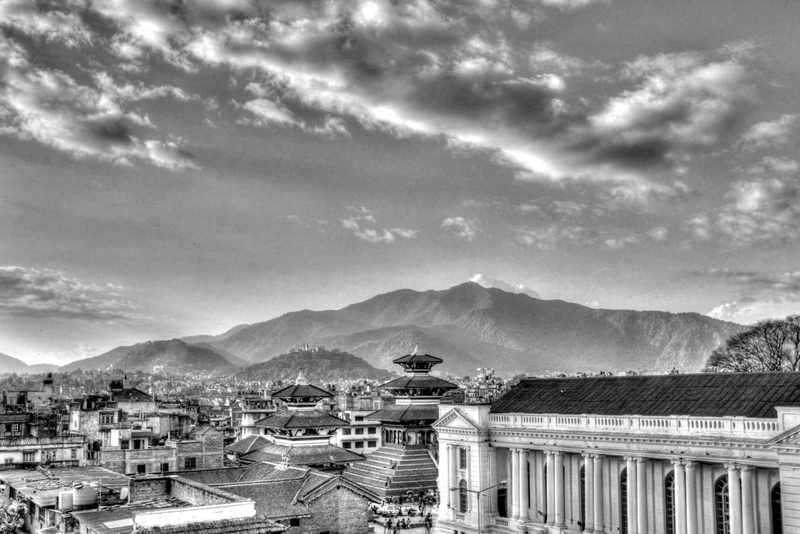 The best way to describe Kathmandu is that it is a full scale assault on your senses. It's crowded, and loud, and visually stunning. There are weird smells and sensations around every corner and if you are not paying attention you will miss it all because it's not stopping for you. The experience is decidedly medieval. Life takes place in the crowded streets and squares. A butcher is chopping the heads off of chickens. Another is dumping a bucket of guts onto the street. Someone is throwing bath water out a window, while a man pulling a cart of vegetables with his head walks by. Packs of dogs that belong to no one roam the streets stealing what they can but looking mostly to exhausted to to do so. An old man is showering in an alleyway and when you stop to peak in a shop your almost run over by a rickshaw. Women with babies strapped to their backs walk their older children to school while trading jokes with other Moms. And somewhere a local teen is etching his name into a temple that is nearly 400 years old. Everyday life is a full day's work. Most homes don't have electricity and even if they did there are 18 hour a day blackouts. Water must be fetched from wells, rice pounded, pots cleaned, produce collected. It's takes a day to get dinner on the table. There is a lot going on! Across our three days we visited the three main cities which were the original three kingdoms that made up the capital: Patan, Kathmandu, and Baktapur. It just happened that we were there during a very important full moon festival so the templates were teeming with people. We got to see weddings, celebrations, offerings, and cremations. We concluded our trip by boarding a prop-plane and taking to the skies to see Mt. Everest. An awe inspiring site! Advice for Nepal? Sit back, relax, and enjoy the ride! Yum! Trying out the local specialty - momos - even fun to say! Steamed dumplings filled with fresh veggies and chicken. All washed down by Everest beer! We sat on the floor for all our dinners. This was a special treat, a 12 course Newari dinner at Dwarika's. It took us 5 1/2 hours to get through! We spent 30 minutes hanging out with these school kids. They were playing a game that was a mix of simon says and sharks and minnows. You have to get to the other side without being tagged but you have to do it in the same manner as the 'shark' instructs, ie., with your hands on your head, or running backwards. They were having a blast! These Nepalese rupees are nailed to this temple because it is believed that this small offering will help with any dental problems! Just one of the hundreds of dogs we saw, but we thought this guy had personality. This is the traditional way of carrying a load. Men all over the city are carrying extraordinarily large bundles with their heads. I hope he has a good chiropractor. Sitting on the top step of the Maju Deval built in 1690, looking at the Vishnu Temple in Durbar Square, Kathmandu. Matt enjoying a crisp Everest beer on the rooftop. Surprisingly good! The 'babas' or religious men at Pashupatinath, Nepal's most important Hindu temple. The adorable inhabitants at Pashupatinath. We got the chance to witness a local wedding. The bride, our guide told us, is not crying tears of joy. She is particularly somber as she (as with most Nepali woman) is entering into an arranged marriage and is quite upset to leave her parents home. My heart went out to her. The apex of the Bodhnath stupa. It was an amazing place! This area is full of Tibetan Buddhists who fled China after 1959. It's painted with the eyes of the Buddha and covered with prayer flags whipping in the wind. It is said to contain a relic from the skeleton of Siddhartha Gautama - the historical Buddha. Massive offerings were underway for the full moon festival. Although I didn't know you could give a pack of ritz crackers? Early morning Everest flight. The pictures don't do her justice (she's on the left). And that's not a cloud, it's the snow swirling off the summit. Anyone know the safety record of Buddha Air? Didn't think so. At Swayambhunath, or Monkey Temple. The monkeys are everywhere! The site of this temple is reported to have been visited over 2,000 years ago, but the current stupa was built in the 14th century. Too funny. It's as if he is saying "oh sorry, I didn't know you'd be here?" Every square inch is taken up with a butter lamp. Lighting one represents the illumination of wisdom. The Tibetan prayer wheels at Monkey Temple. When you spin them it is just as if you have chanted the mantra. The view over all of Kathmandu. A burnt offering at Golden Temple in Patan. One pedals, one steers and one is just along for the ride! They were delighted when they finally took off down the street! 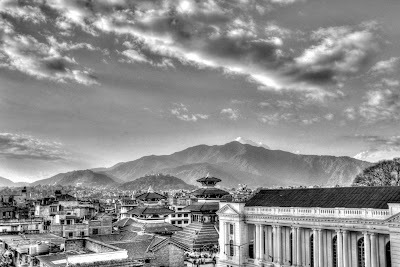 Kathmandu's Durbar square just before sunset. How many people can you fit in a rickshaw? Two. Definitely two. The city's going-out district Thamel by night. The best preserved of the three royal squares. Bhaktapur's Durbar square. Beautiful, medieval, and $15 to get in. No wonder it's not crowded. The Nyatapola Temple in Bhaktapur built in 1702 and one of the only temples to survive the 1934 earthquake intact. Each colored chalk means a different blessing for the Hindu temple. A solemn scene at the Pashupatinath temple. Any Hindu in Nepal (if they can) wants to be cremated here. Those are funeral pyres and yes - the cremations are taking place. The air is choked with shoot and the mood is unlike anything I've experienced. Even more shocking is that that gray sludge is the holy Bagmati river (apparently the water is there somewhere) and the deceased are cleansed by family members in the water before being laid out on the cremation ghat. A sobering experience. The wise babas. So wise that they realize they can make a living on people just taking their pictures. Apparently they are wise businessmen too. Hey! Why not help hang some prayer flags for good measure! The last afternoon in Patan's Durbar square. We get the weirdest stuff under our door! Most community circulars remind you of dues and alert you to window washings. Living in the shadow of the world's tallest building and its adjacent park means that we are constantly getting weird reminders and alerts for the many events that take place in the area. The note recently was one of the weirder ones. A quick primer: in the UAE it's not uncommon to see government sponsored (funded) mass weddings between locals. Simply put the population is dwindling and with globalization and travel it seems that a lot of Emirati men aren't choosing to marry Emirati women (or at least not enough to grow the population). It's not a big deal for the men who can marry anyone they want, but if an Emirati woman marries a non-Emirati man she is stripped of her citizenship and her children cannot be Emirati's either - how's that for incentive? So in order to encourage the unions between locals, the government offers to pick up the tab and give you a nice healthy spot bonus to kick start your new life. You just have to not mind that you might be sharing the ceremony with hundreds of others in a convention hall. This note was just a bit different. It was for a DEWA Mass Wedding. DEWA = Dubai Electric and Water Authority. The state-run utility company is hosting a mass wedding for employees? Yup that's pretty much it. So I "crashed" the wedding from my balcony, of course. (Men only, women celebrate separately). Next time you need an officiant at a wedding why not B&O Railroad? Hope the evening was electrifying and their weren't too many water works at the celebration. The Rings of Friendship: US-UAE Renew Their Vows! It's been 40 years together. Sometimes we bicker, sometimes we nag each other, but at the end of the day we just want to hold hands! Last night the US and UAE celebrated 40 years of diplomatic relations by rededicating the Rings of Friendship statue in Dubai Creek Park. The American Business Council hosted this special event and we were thrilled to have Sheikh Hamdan bin Mohammed bin Rashid Al Maktoum, Crown Prince of Dubai in attendance to receive the re-dedication (Sheikh Mohammad's son and next in line for the throne). Consul General Justin Siberell and Sheikh Hamdan. 16 years ago the Rings were given to the UAE to commemorate 25 years of US-UAE relations and were received by none other than Sheikh Momhammed (then Defense Minister) so it was only fitting that 16 years later we rededicate them with his son presiding over the event. The US was one of the first countries to establish an embassy in the UAE when they became a country in 1971 and today they are the number one trading partner for the US in the entire Middle East region. Just a bit about the rings: The Rings, each 16 feet (4.9m) in diameter, 27 inches (69.6cm) wide and 9 inches (22.9cm) deep, weigh 6 tons and are constructed of the highest grade American 316L stainless steel, polished to a mirror finish. They rest on two curved pedestals of Vermont granite, which weigh more than 11 tons. We had a great night for the event (not too hot yet!) and of course it was topped off with fireworks. Natch. Here's the article in today's paper. However, my favorite moment of the night - we had a local high school provide their jazz band for entertainment while we waited for the royal. They delighted us with smooth jazz tunes until unbeknownst to their conductor the Sheikh had come down the path. He quietly (looking somewhat stunned) strolled into the event to Dave Burbeck's Take Five! I'm sure that's a first! Amy "Wine" house Comes to Dubai.